Ing conducts the program with student and faculty volunteers from Tufts, colleagues from the University of Connecticut and New York University, and a representative from Colgate-Palmolive. This is the third year Ing coordinated the Mini-Med activities at the Museum of Science, and the second on Nantucket, where the school district uses part of a state Department of Education Innovation Pathways grant to cover the expenses. The United States doesn’t rank very high in the international placement exams that kids take as they near high school. Exposure to STEM and giving youth opportunity to realize that health sciences could be a future career for them makes them globally competitive with the rest of the world. “And, we also want it to be fun,” Ing said. 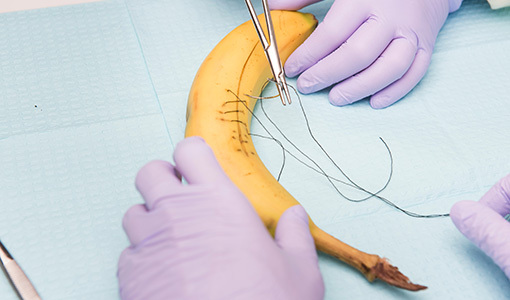 Ing had sent me a link to the video before I attempted my handiwork on the banana, and I had watched it several times before my foray at the Sim Clin. These kids watched it just once, but for most of them, that seemed to be enough, although, granted, they also had individual guidance from the students and professors on hand. Proper sutures, Ing explained, need to keep the skin close, so the wound will heal without bacteria and other germs getting in, and there’s little or no scarring. 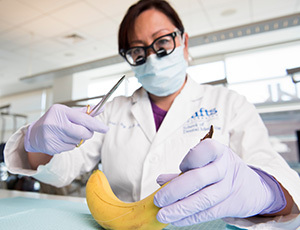 Dental students have traditionally practiced on objects such as banana peels, hot dogs, or chicken skin, before training in the clinic. Ing said she learned the skill from her surgeon-father, who taught her on the family’s Thanksgiving turkey. Unlike the kids, by the end of my afternoon of not-too-delicate suturing in the Sim Clinic, I was exhausted, discouraged—and hungry. So, while I waited for the elevator, I ate my leftover patients.